Symbols, images, place and cultures merge. an inner spirit is released. My introduction to artist Betye Saar came about in an unexpected way. Three or four years ago, my mother and I took a weekend road trip to San Francisco for Thanksgiving, and we stopped by the Museum of the African Diaspora on a sightseeing tour. After checking out several exhibits, we rushed through the museum’s gift store, which was about to close for the night. In my haste, I picked up a boxed set of greeting cards entitled “Memories,” intending to present it to someone as a Christmas gift. 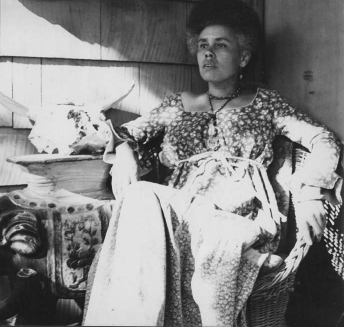 Months would pass before I looked at those cards again and learned more about the artist, Betye Saar. Ms. Saar can be considered an Afrofuturist, much like Jean-Michel Basquiat, fusing elements of fantasy, science fiction, social justice and Afrocentricity in her artwork. Her medium is found objects, or assemblage. She collects photographs, wood, fiberglass and amulets, adds a healthy dose of righteous rage, and becomes a modern-day conjure woman. This dream-like bridge between the past and future intrigued me enough to keep Saar’s “Memories” boxed set for myself. One of the pieces that speaks to my spirit is entitled “Black Girl’s Window.” A mixed-media assemblage, the work features the silhouette of a black woman with a short natural pressing her hands and face against the window of a wood frame. Reflected above her head in the panels are prints of the moon, stars, a skeleton, a human brain and children embracing. The piece is inspiring because it reminds me of the boundless imagination we possess as black women — we are creators, dreamers, soothsayers, thinkers — but we are limited by a society that seeks to erase our complexity through reductive, disempowering images. While researching Ms. Saar’s life, I was thrilled to learn that she is an Angeleno, as am I, and still lives in the city. Her introduction to the beauty of found objects came about while visiting her grandmother in Watts. As a girl, she watched sculptor Simon Rodia piecing together what would later become the Watts Towers, a monument consisting of steel, mortar, sea shells, broken glass and tiles. Watching the Italian immigrant mining beauty from the rubble helped to inform her own aesthetic, reclaiming negative images of African-Americans and transforming them into something powerful and divine. Ms. Saar visited Nigeria, Haiti and Mexico during the 1970s, incorporating elements of mysticism with altars, bones, snakes and ritual objects, which she regarded as her ancestral works. Among the many themes present in her art are identity, womanism, spirituality and black liberation. Ms. Saar was involved in the Black Arts Movement, and she began collecting images of Uncle Tom, Sambo and other derogatory folk figures to deconstruct them and strip them of their power. 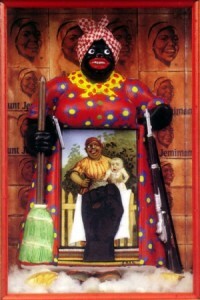 Her first protest piece, “The Liberation of Aunt Jemima,” was exhibited in 1972. In this signature work, a smiling, big-busted, handkerchief-headed domestic is situated inside a wooden box. She wields a broom in one hand and a rifle in the other. The box also contains the print of a large black woman holding a white baby juxtaposed with a black power fist. The bold contrast of caricature and weaponry — the militarization of mammy — both amuses and disturbs the viewer. Reinterpreting the degrading image of Aunt Jemima as a warrior sister crushes America’s love affair with servile black women while simultaneously flaunting our agency through self-awareness and violence, if need be. Although the piece debuted forty years ago, Ms. Saar was particularly prescient, especially in light of movies such as The Help, a nostalgic tribute to mammy which flirts with the memory of our shackled selves. I might never have discovered this sister visionary had I given away my boxed set of cards a few years ago. Or maybe I would have. Truth has a way of calling out to us, beckoning us when we least expect it. Betye Saar’s work was recently featured in Now Dig This! Art and Black Los Angeles 1960–1980, a Hammer Museum exhibit curated by Amiri Baraka’s daughter Dr. Kellie Jones. I remember walking through the installation, taking in life-sized pieces such as “Indigo Mercy” and “Black Girl’s Window,” feeling as if I had stumbled upon an artifact at once familiar and bizarre. Saar’s art informs my own work as a writer of speculative fiction in that she recycles emblems of pain, loss and exploitation to craft a futuristic portrait of black womanhood that is surreal, darkly comedic and sacred. I love the idea of excavating found objects in my own writing, digging away until I have uncovered the stone, the wood, the broken glass that has the ability to cut as well as transform.